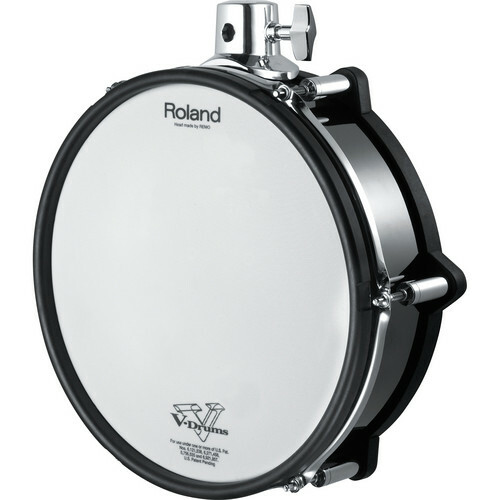 The PD-128 V-Pad from Roland is a 12" mesh head designed as a tom pad the V-Drums TD-30KV electronic drum set. It features an advanced rim sensor for enhanced dynamics and rim-shot depth plus an exchangeable black-chrome shell wrap. When used with the TD-9, TD-12 or TD-20 sound module, both sensors fire simultaneously for a more accurate representation of the interaction between the head, rim and strike of your sticks. The PD-128 features a two-way mount holder which enables vertical or horizontal mounting on a Roland MDS series stand or pipe tom stand. The outer shell features an attractive synthetic material with an authentic brushed-metal appearance. However, its look can be easily changed with optional blue or red brushed-metal wraps (available separately). Box Dimensions (LxWxH) 15.2 x 15.1 x 6.0"